Writers of the middle Ages claimed aquamarine was the most popular and effective of the “oracle” crystals. When cut as a crystal ball, it was thought to be a superior stone for fortune telling. Many methods of using the stone as a divining tool were described in ancient literature. One method involved hanging a stone by a thread over a bowl of water, just touching the surface. The inner edge of the bowl was covered with the characters of the alphabet. The diviner was to hold the top of the thread and allow the stone to hit certain letters, which would spell out answers to an important question, sort of like a ouija board. Another method was to cast a crystal into a bowl of pure water. The disturbances in the water would reveal messages on the surface of the liquid. 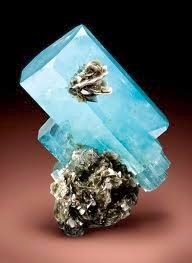 Aquamarine’s powers of revelation were also said to help one in search for lost or hidden things.